Approximately 40,000 Australians are stung by blue bottles every year, resulting in extreme pain and skin reactions. Jellyfish sting by firing off a barb into the person before injecting venom - The amount of venom, is usually determined by the pain experienced and how long it lasts (anywhere between 1-3 hours). Some remedies for blue bottle stings over the years have included rubbing sand into the area, ice, vinegar, urine, cold tea and warm beer…. These days, after many summers of painful blue bottle stings, hot water is now deemed best to treat the pain. 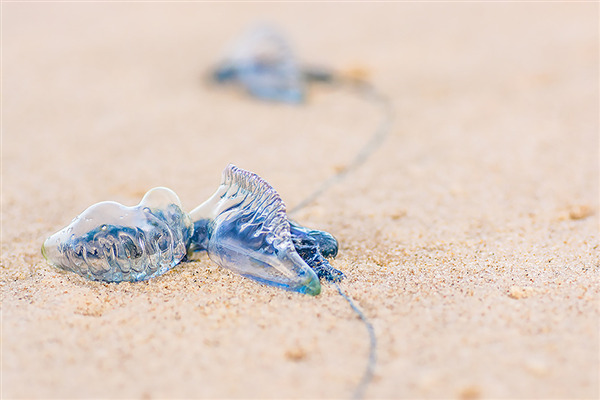 Many blue bottles hang out right at the shore. Many of you can probably recall seeing shiny blue things scattered across the beach after being washed up by a wave. This the most common place to be stung, and is likely the reason why it happens more so to kids as that’s where they like to play. The most important thing to remember if you or one of your family members gets stung, is to stay calm and find a beach side shower – either near the carpark or the lifeguard tower to wash the area with warm water. If the pain persists the use of panadol will help take some of the discomfort away until the pain subsides. If you notice the area is looking worse, much more swollen or you are experiencing fever, nausea or still in pain hours after the sting, you should seek medical attention.